We'll own you in Sepak Takraw. 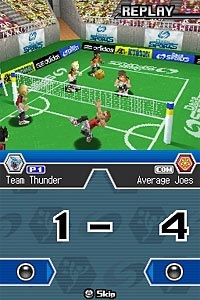 Hudson Soft has become a force in sports gaming, with its first two Deca Sports titles on the Nintendo Wii and, this month, its first release in the series for the Nintendo DS, aptly named Deca Sports DS. Granted, these are casual sports at best, so don't look for these guys to tackle the more serious simulation games like Madden or FIFA. Regardless, Deca Sports DS is more fun than we thought it would be, especially considering how much Deca Sports 2 let us down. The game features a total of ten activities, which you can play solo or with friends (more on that later). The activities are Golf, Ping Pong, Sky Diving, Arm Wrestling, Wall Climbing, Rugby, Cheerleading, Sepak Takraw (a combination of soccer and volleyball), Clay Shooting and Bobsled. The variety goes all over the place (seriously, cheerleading combined with bobsledding?! ), and some of the activities simply don't measure up. Arm wrestling, for example, is merely just a three-tap system to make the other guy submit. As for wall climbing, it would be better on the Nintendo Wii. Still, this collection has merit. Rugby is the best digital recreation of the sport that we've seen since EA Sports' PS2 effort a few years back, and Sepak Takraw is something that grew on us, to the point that we wouldn't mind seeing a separate release for it somewhere down the road. Each game has quick exhibition matches, although you can also try out various Challenges if you're up for testing your finer sports chops. That said, Deca Sports DS is built for competition. As good as single-player is, it's even more fun adding a few friends to the mix. The game supports six-player action, and best of all, you don't need multiple cartridges. Hudson Soft wisely threw in downloadable play, so you can have a party with just one cartridge. The downloading doesn't take long, and it operates with very few hitches. Granted, you'll have more fun with some games than others. We just can't see multiplayer handheld cheerleading competitions. Despite the wireless functionality and variety of activities, Deca Sports DS doesn't really have much else going for it. The presentation is rather plain, with unfinished, pixilated characters performing their activities in somewhat average settings. It's easy to see what you're doing, but Hudson Soft failed to spruce up the surroundings. The music is equally mediocre, with only a few background tunes and sound samples. It would've been ideal for Hudson to include a few of its trademark characters or familiar themes, particularly from the Bonk or Adventure Island brands. Finally, the game doesn't feature any sort of functionality with the Wii offerings. Sure, the activities are different than those two, but being able to share stuff between them, like the sports themselves or even friend information, would've been a huge benefit. Although Deca Sports DS doesn't come close to being a top sports game, it's a decent pick-up. The multiplayer connectivity and inclusion of particular sports (particularly Sepak Takraw) make this worth at least a rental. What's Hot: You can play up to six people through one cartridge, some of the sports hit the spot (particularly Sepak Takraw), Challenges will keep you busy in single-player. What's Not: Average presentation, some of the sports are more fun than others, no connectivity with the Wii versions.